Highlighting the work of artists and photographers from the Majority World. Polyp's cartoon from the November edition of New Internationalist magazine. 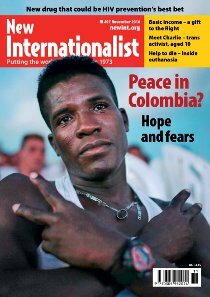 Steve Parry's latest column from the November edition of New Internationalist magazine. I, Daniel Blake, directed by Ken Loach; The Innocents, directed and co-written by Anne Fontaine.